Join us this week for part one of our 3DMJ Coach Influences Series. 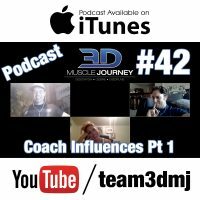 Today’s episode begins a two-part series on the figures, mentors, and major influencers in each of the 3DMJ coach’s lives. 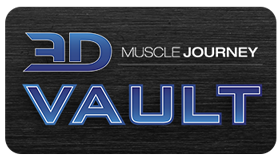 This week, Andrea is joined by Brad and Eric, to discuss who their childhood heroes were, who they first looked up to and learned from in the bodybuilding community, and who they continue to look to and learn from even still today. Along with going over their past and present influences, the group also dive into stories from the past which had profound impacts on their lives. What is one of Brad’s biggest regrets? Which coach lead the original coaching philosophies of Team 3DMJ? Who inspires Andrea more than anyone? Check out today’s episode to find out! A reference to Canibus – Second Round K.O. is so obscure I feel like I’m the only one who understands the references Eric is making in some of these podcasts, hilarious! Seriously though great content as usual!